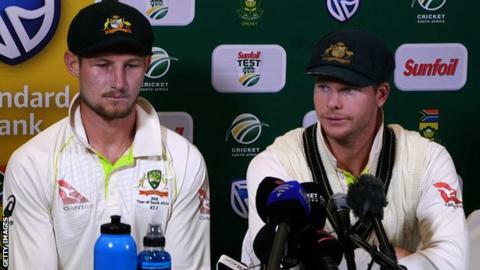 Australia captain Steve Smith has been banned for one match and fined his entire match fee by the ICC for his part in a ball-tampering incident in the third Test against South Africa. Smith said that the team's "leadership group" had a plan, carried out by batsman Cameron Bancroft, to tamper with the ball to "get an advantage". Smith will now miss the fourth and final Test of the series. Bancroft was fined 75% of his match fee and given three demerit points. Smith admitted a charge of conduct "of a serious nature that is contrary to the spirit of the game", said a statement from the International Cricket Council, the sport's governing body. To compound matters for the Australians, they saw all 10 wickets fall in the final session on day four to lose the match by 322 runs. Facing a target of 430, which would have been a world record chase, they reached 47-0 at tea but were all out for 107. Smith had made one from 16 balls when he top-edged Kagiso Rabada for six, but soon departed for seven.